Raiganj Wildlife Sanctuary Also known as Kulik Bird Sanctuary, is situated near Raiganj in Uttar Dinajpur of West Bengal. The area of the sanctuary is around 1.30 km. The core area is about 0.14 km and the rest is buffer area. The Kulik river flows around part of the sanctuary and acts as the boundary in its eastern and southern parts. The shape of the sanctuary is that of the English alphabet "U". The sanctuary has a network of artificial canals connected with the river Kulik. During monsoon the river water enters the sanctuary, which supports a wide variety of food for the birds, particularly for the Asian openbill, whose main diet is apple snail. The sanctuary is home to 164 species of birds. Several types of migratory birds arrive here each year from South Asian countries and coastal regions. They start arriving from June. The migratory species includes open-bill storks, egrets, night herons and cormorants. The resident birds are kites, flycatchers, owls, kingfishers, woodpeckers, drongoes, etc. The bird sanctuary is home to 164 species of birds, and some 70,000 to 80,000 migratory birds visit the sanctuary every year. During the period from December to February, numerous visitors from different districts of West Bengal and Bihar visit the sanctuary. Global population of the Asian openbill is estimated to be 130,000 by Wetland International, and around half of them live in Asia. 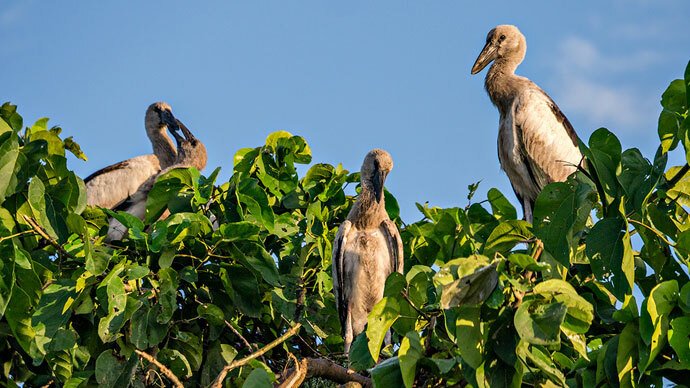 The species is known to breed in a colony, called heronry, but there are very few heronries in India, particularly those that are well protected against human greed. Ornithologically, Raiganj Wildlife Sanctuary is a very important heronry. As per the breeding population data of Asian openbills, the sanctuary reveals that it regularly supports 32 - 40 percent of the existing population of Asian openbills of South Asia. A heronry, which supports such a high percentage of Asian openbills, is not only a nationally important heronry but also an internationally important heronry.